Delton "Wally" Walling, 89, was a Navy 2nd Class Signalman during the Dec. 7, 1941, attacks on Pearl Harbor. He was in the shipyard water tower when the first Japanese bomb dropped on Ford Island (in background). Walling signed a Pearl Harbor flag that flies at half mast today in Eagle County's Freedom Park in Edwards. EDWARDS — At dawn today, Eagle County’s Freedom Park became home to reminders from two attacks on the United States by a foreign power: A block of Pentagon limestone blown from the building when terrorists flew a plane into it, and a Pearl Harbor flag. Pete Thompson, commander of the local VFW post, will lead other local veterans in raising a Pearl Harbor flag to half staff. It will fly until dusk, when it will be lowered and stored. “I wanted a flag to be flown locally to be flown in Freedom Park next to the Pentagon limestone,” said Terri Martinez-Johnson, who arranged for the flag to live here in the valley. Pearl Harbor flags work like Capitol flags. They’re raised, fly a while and are lowered to be replaced by another flag. Pearl Harbor flags are signed by an attack survivor. Ours was flown over the U.S.S. Arizona monument and signed by Navy 2nd Class Signalman Delton Walling. He joined the Navy just before the war, and made chief in three years. He was the communications guy for Admiral Husband E. Kimmel and Admiral Chester Nimitz. Martinez-Johnson works with Singletree and her brother, Danny Martinez, is Pearl Harbor’s chief historian and works at the USS Arizona monument. Not long ago she asked her brother if he could come to the Vail Valley for Veterans Day or Memorial Day, but Pearl Harbor’s chief historian’s time is generally spoken for on those kinds of days. If he’s not doing that he’s hosting the Discovery Channel’s “Unsolved History,” or something else historical. So Terri asked if he could send a Pearl Harbor flag, and in less time than it takes to say, “Yes ma’am,” the flag was on its way, signed by Delton Walling, a Pearl Harbor survivor. Her brother was a bit of a misguided youth, she says. The average adolescent problems with authority were well above average in his case, and the Jesuits at his Catholic school wanted to kick him out. We’ll just say their dad had to provide a little extra incentive for them to keep him. As is often the case, he ran across a great teacher, a nun who was enthusiastic about history and Danny caught the history bug. Their grandparents and mother were living in Hawaii, and their grandfather was working in Pearl Harbor. He had finished his shift and was walking outside when the bombing started. He was packing a movie camera for home movies and got some footage, but the military quickly confiscated it. The first Japanese bomb hit Ford Island at 7:56 a.m. when group of 183 Japanese attack planes swooped in to systematically destroy the U.S. fleet. Thirty minutes later, a group of 172 aircraft attacked. The attack was over by 10 a.m., but the devastation was gut wrenching: 188 American planes were destroyed, 1,178 military members and civilians were wounded, and 2,403 American were killed. Eventually, Terri’s and Daniel’s mother mellowed. They went for the 50th anniversary and loved it, Terri said. They even met one of the nuns who taught their mother in school. 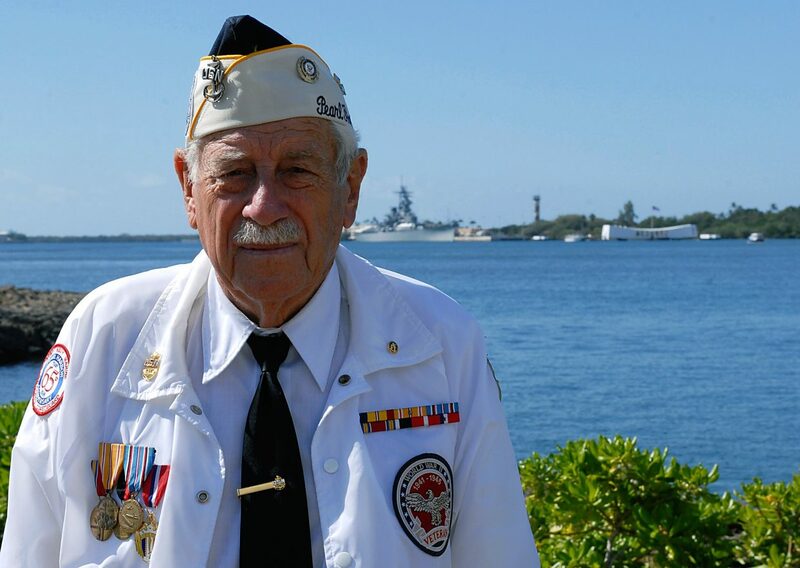 When Walling climbed a water tower in the Pearl Harbor shipyard at 6 a.m. on Dec. 7, 1941, he wasn’t there to start his shift, which didn’t start until 4 p.m. He was just trying to collect money from a buddy who was on duty. From 180 feet in the air, he saw bombs exploding around him so quickly he couldn’t look around fast enough to see every explosion. But he saw the chaos, death and destruction unfold. So, he had his own finger medically amputated and joined the Navy. Now he was watching his beloved Navy sink into the Pacific Ocean. It was chaos, he said, a “terrible scene” with all the ships on fire and people swimming through the mess. From his perch in the water tower, he had watched as six scout planes from the Enterprise come in, returning from their flight out to sea to look for Japanese aircraft carriers. Night was falling, and in the mass confusion U.S. forces fired upon the friendly aircraft, killing all but one of the six pilots. The next day, the U.S. declared war against Japan and Walling was promoted on the spot to E-6. He spent the rest of the war in the South Pacific — two and a half years out to sea, without even putting a foot on shore, under attack all the time. His ship was one of six that were taking on all the casualties, with only four doctors attending all the needs of the patients on board. His job was to sew up the dead in canvas bags and put their personal effects into envelopes to send to their families. When the war ended in 1945 and Walling separated from the U.S. Navy, he was 26 and 80 percent disabled. He went on to become a foreman for a big paper company for 29 years, built houses and had the biggest tree service in California until he retired in 1976. Staff Sgt. Carolyn Viss with the Joint Base Pearl Harbor-Hickam Public Affairs contributed to this story. Staff Writer Randy Wyrick can be reached at 970-748-2935 or rwyrick@vaildaily.com. Follow him on Twitter at @torqueandrecoil.